After the Kosovo war of 1999, the United Nations Interim Administration Mission in Kosovo (UNMIK) took over the governance of Kosovo. Kosovo was still a province of Serbia, but Serbia did not have much to say anymore. Kosovo unilaterally declared ‘Kosovo independence’ on February 17th, 2008. Kosovo was from that very moment de facto independent from Serbia and called itself the Republic of Kosovo. The new status was quickly backed by a majority of Western countries. Currently, the majority of the UN member states recognize its independence, including 23 out of 28 EU-countries. Greece (one of the five others) might accept the independence soon. Serbia, backed by Russia, is strongly against the thought of Kosovo independence. But the relationship between Kosovo and Serbia has been improving the last couple of years (with some ups and downs, as you might expect). 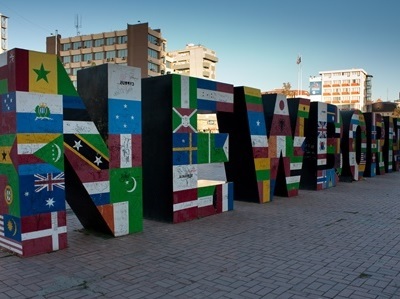 The NEWBORN statue in the center of the capital Pristina symbolizes the new status of Kosovo. Kosovo born singer Rita Ora (famous for several number-1 hits in the UK) danced upon this statue in her video clip Shine Ya Light. The statue was for its first five years yellow colored. With the celebration of the first lustrum, people painted the flags of all the recognizing countries on the six newborn letters. The day of independence is an official holiday throughout the nation. The new republic has had its own flag since the Kosovo independence. The blue ‘Kosovo flag’ shows in yellow or gold the map of the state with six white-colored stars above it. The six stars represent the six biggest ethnic groups in the country. 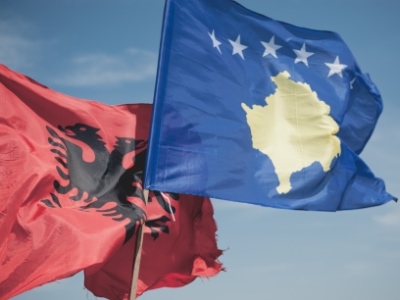 Because the Albanian flag used to be the unofficial flag for the Albanian Kosovars before independence, many Kosovars still prefer the Albanian one. During holidays, weddings and parties, often both the new flag and the red-black Albanian flag are used. Are you interested in other information about Kosovo? Visit our information page. Why do some Serbians claim that Kosovo is Serbia? We explain it at the Kosovo je Srbija page. You might also like the FAQ: Is Kosovo a country? See how beautiful it is look ..